X-Camo is a unique blend of natural colors. It is very similar to that of the early WWII colors, but in a digital pattern. You will see that the X-Camo works in a wide variety of surroundings. This camouflage will hide you better than ANY Camouflage on the market. 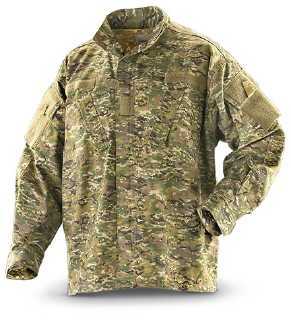 *60% Cotton, 40% Polyester Rip-Stop *All shirt features made to Military Spec Army Cobat Uniform (ACU) *Hook & loop-faced patches for attaching name and rank *Hook & Loop faced shoulder pockets for unit patches and skill trades. Pockets measure 6" long and 5 1/4" wide *Two slanted chest pockets with hook and loop closure measuring 6" by 6" *One sleeve has a pocket stitched into three compartments to hold up to three pens measuring 5 3/4" long and 3" wide *Sturdy double zipper with hook & loop closure for easy on/off *Mandarin collar that can be worn up or down with hook and loop closure *Hook and Loop cuffs *Double needle felled stitching *External elbow pouches with hook and loop closure for elbow pads (sold separately) *Vat-dyed **X-CAMO IS A REGISTERED TRADE MARK OF MILITARY OUTDOOR CLOTHING, INC. We only manufacture the best quality products for our customers! Picked this up at a local military surplus outlet. I must say that this is one of the best camo outfit that I have ever tried out. Works fine in all areas. I highly recommend it!